James R: Endings are often the worst. When you fully fall in love with a piece of art or culture that's episodic by nature (comics and TV in the main) there is always a creeping malaise that comes with that affection. With each passing instalment, you find yourself thinking, "Well, how is this going to end? And what if it's a disappointment?!" Over the last few years, we've seen some examples of TV 'sticking the landing' magnificently - Breaking Bad and Mad Men did it, and despite the arguments over it you can't deny The Sopranos did too. In comics, finality is a rarer thing - the very nature of a lot of the comics we love means there is no real 'end'. Even when books do finish, there's usually the feeling that it's a pause rather than a full stop. However, there's still some occasions where a finale has delivered: Y: The Last Man, Sweet Tooth and Planetary had concluding issues that both amazed me and left a lump in my throat. So that brings us on to C.O.W.L. 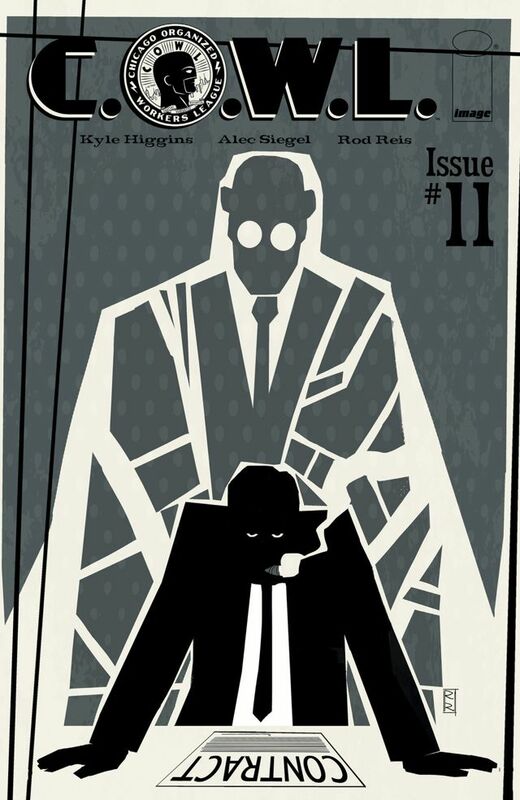 Issue #11 is it's final chapter, but I am desperately hoping it's not the end. Since it's debut in 2014, Kyle Higgins, Alec Siegel and Rod Reis have maintained a phenomenal standard. In it's initial solicitations, I remember feeling sceptical - the notion of super heroes existing in a 'real world' setting felt too derivative, and as a rabid fan of Watchmen, I foolishly thought that C.O.W.L. would be a retread of the themes and ideas from that masterwork. By the end of the third issue though, it was clear that C.O.W.L. was something else entirely - fresh and innovative, it spun many threads together to create a fully absorbing narrative and a great example of comics at their best. Firstly, Higgins and Siegel did a tremendous job of establishing time and place. I have often heard C.O.W.L. described as a 'Superhero Mad Men' and that's not a bad comparison in many respects as both Mad Men and C.O.W.L. give the reader a definite sense of verisimilitude. Both also had a fascinating central protagonist too. Mad Men had Don Draper, a man projecting an image of someone who he truly is not, and C.O.W.L. had Geoffrey Warner. 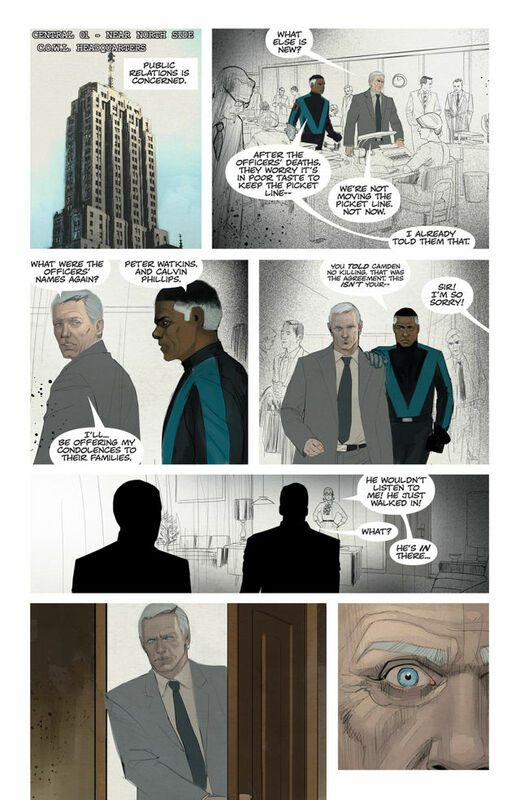 The former hero known as the Grey Raven, Warner is a Machiavellian genius who we learn, over the course of the run, is capable of doing anything to protect his reputation and the idea of the C.O.W.L. organisation. The book had a a properly jaw-dropping murder at it's heart too. 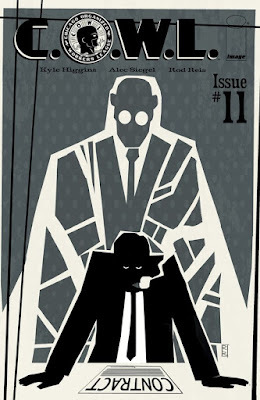 I won't spoil it, as this review is a shameless plea for more people to track down back issues or trades, but Higgins and Siegel demonstrated that there were no sacred cows in C.O.W.L. and that every character was in danger. Speaking of characters, C.O.W.L. has an embarrassment of riches - from Radia, through to Eclipse, every member of the cast felt fully realised and could have carried a book on their own. When I read that C.O.W.L. was coming to an end, I was genuinely saddened - for me, the book was complex and smart enough to run for years, and with a great cast, the opportunities for more stories seemed endless. The final issue, released this week, naturally highlights the strengths mentioned above, but Higgins and Siegel (thankfully) choose not to make this a definitive conclusion. Even though some of the plot threads are brought to an end, many are left tantalisingly open, and I can only hope that Higgins makes good on his promise at the end of the issue that "We'd never rule out coming back to tell more stories."